I have uncovered records of competitive boat racing dating as far back in time as 1913. For thirty plus years following that initial competition the sport of inboard boat racing became the centerpiece of the city’s annual Fourth of July celebration. This installment will close out that chapter of boat racing’s history on the lake. After the surprising success of the first three years of Coeur d’Alene’s Fourth of July celebrations, the three-day event suddenly faced major challenges. The development of a competing Independence Day celebration in Spokane, and the growing popularity of a horseracing track near the Idaho-Washington state line appeared to threaten the future of the Lake City’s multi-day celebration. Despite these challenges, Coeur d’Alene’s city fathers held on to their multi-sport format, but they tweaked the event to make it more community centered. Along side of the evolution of the Independence Day celebration, boat racing was undergoing steady change as well. New hull designs and bigger and more powerful engine were slowly changing the sport. 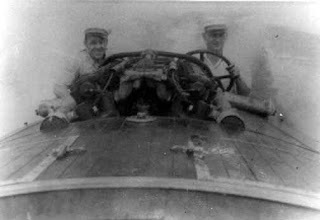 For example, the 1920 race saw Paul Mitchell pairing his newly constructed mahogany runabout Freckles with a Liberty airplane engine. Machining the needed parts himself, Mitchell had converted the aviation motor to power his runabout. With the new power plant, the Spokanite turned the four-mile course in a record 18 minutes and 1 second, and the Freckles easily dispatched the Miss Coeur d’Alene to take the cup. The 1921 race went to the Greyhound owned by Spokane’s R.C. Dillingham. 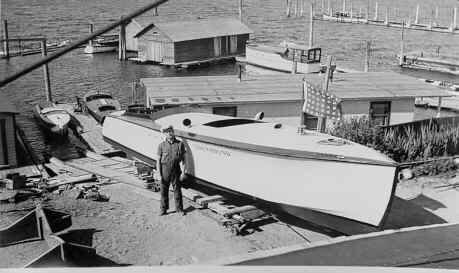 Built by Coeur d’Alene boat builder Bob Yandt, the 33-foot long gentleman’s raceboat, employed a John L. Hacker bottom design and a 250-h.p. Sterling engine that allowed the new boat to power through the typically rough water conditions that had prevailed on Lake Coeur d’Alene during earlier races. The powerful Greyhound edged the 1920 champion with a new record time of 6 minutes and 58 seconds over the four-mile course. The time eclipsed the Freckle’s previous mark by slightly over eleven minutes. The 1924 version of the challenge race was unique in that it was held during the evening hours rather than the heat of the day. Beginning at 6:30 p.m., the race was followed by the city’s fireworks display, and an estimated crowd of 25,000 people viewed both the races and other 4th of July activities from the sands of City Beach. While warming up for that same 1924 race in the late afternoon hours, Coeur d’Alene’s Bruce McDonald flipped his brand new boat, the Black Maria. The boat was estimated to have been traveling at a scorching fifty-five miles per hour when it suddenly overturned. McDonald and his engine man Fred Boyer were both thrown into the water, but they were quickly rescued by another boat. It was reported that there were a few tense moments when Boyer and McDonald had to frantically swim out of the way of another passing race boat. McDonald’s craft was retrieved from the lake, but it was deemed too waterlogged to compete in that evening’s racing. The winner of the 1924 competition was another of Bob Yandt’s creations. Built for Dr. Max Smith of Wallace, Yandt’s Attaboy was smaller than Yandt’s Greyhound design by nearly four feet in length and was powered by a much bigger and more powerful 300HP Fiat engine. Attaboy took the ’24 challenge race despite a valiant effort by Dillingham and his Greyhound. The sister boats dashed around the two-mile course in front of the beach twice during the race, and at one point in the first lap the Greyhound even held a slight lead. The Attaboy appeared to be faster on the straightaway stretches, while the Greyhound held an advantage on the sharp turns at each end of the course. With a powerful surge on the final straightaway, the Attaboy took the lead for good, and Dr. Smith happily took the new Coeur d’Alene Chamber of Commerce Cup back to his Silver Valley home. So well built was the Attaboy that it was said to have still been in use on nearby Newman Lake well into the 1950’s. The Greyhound also survived into the modern era, and it was used for years on Lake Coeur d’Alene as a water taxi. Eventually the Greyhound was retired from use and dry-docked, where it slowly slid into a state of disrepair. Alan Thomle of Seattle saved it from destruction and lovingly restored it to its original glory. 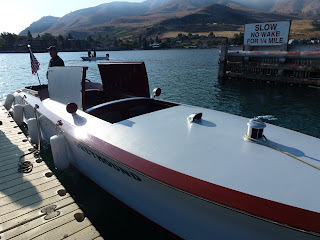 It is now a work of art, and I was fortunate enough to see it run on Lake Chelan during the Mahogany and Merlot vintage race boat event in October of 2012. During the 1930’s, two point “step” hydroplanes replaced the cigar shaped gentleman’s raceboats that had dominated the races during the teens and twenties. The radical new racing design employed a large transverse “step” in the hull, located amidships, to create a hydroplane. As a result of the innovation, the bottom of the boat made contact with the water at only two "points" on the hull. The first point was a small two-to-three foot portion of the hull just forward of the transverse step, and the second point was at the extreme aft section of the hull above the rudder. It is not surprising that veteran Coeur d’Alene boat builder Bob Yandt would choose to integrate the new design factor into one of his creations. The opportunity came when he was contracted by Spokane’s Clarence I. “Cip” Paulson, the son of mining magnate August Paulson to construct a boat for him to be launched in time for the 1932 race. Shortly after its launching, the sleek 26-foot mahogany craft was seen cruising through the four-corner regatta course at speeds in excess of 70 mph. It employed a 450 horsepower, V-12 Liberty aircraft engine which developed nearly 2200 rpm, and it easily dispatched with Joe Pedicord’s Number III in the 1932 race. When Paulson tired of racing his unnamed boat, Yandt stored it at his lakefront boat shop for a while and then negotiated its sale to the partnership of Howard Hudson and Harry Wilson. The two downtown Coeur d’Alene businessmen took possession and operated it as a thrilling speedboat ride concession for a few years scaring passengers on high speed runs across the lake. To facilitate passengers, Hudson and Wilson cut a rectangular hole in the long foredeck ahead of the open engine and installed seats for up to six paying passengers. In its new configuration, the boat enjoyed a lengthy second life while continuing to race in the yearly challenge cup races. Hudson and Wilson named the reconfigured hydroplane the Fire Chief, the result of a deal the two young owners had struck with the Texaco Oil Company to sponsor the boat. Texaco Oil provided the partners with fuel as part of the sponsorship deal – and the big boat supposedly used a considerable amount of it – and in return, Hudson and Wilson painted the hull partially red, added the Texaco “star” logo, and gave it the Fire Chief moniker. In the fifty-lap 1940 challenge race, Hudson and Wilson’s Fire Chief failed to finish. The boat had rolled over on a turn during a test run on the two-mile course prior to the race and the clutch plates became wet and swelled. In order to run, the mechanic had to loosen the clutch plates. That adjustment proved to be the team’s undoing when at the end of thirty-two miles of racing the plates became too loose to hold and the boat went dead in the water, forcing them to withdraw. The Fourth of July challenge races appear to have been discontinued before the 1941 rendition could be run, and outboard races seem to have replaced them as the staple of the annual three-day celebration. 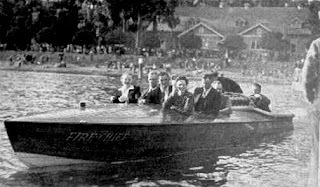 The final 4th of July Coeur d’Alene inboard regatta that I was able to document appears to have been the very same 1940 race where the Fire Chief failed to finish. 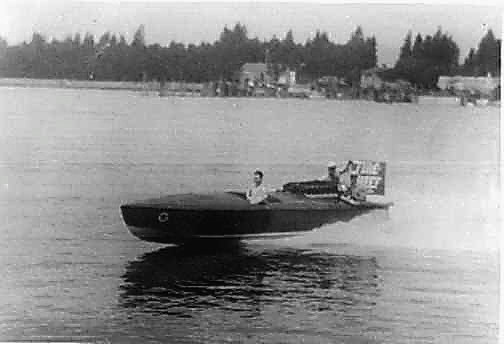 In that series ending 1940 race, a crowd estimated at between 30,000 and 40,000 spectators watched as Don McRae of Seattle driving the Miss Take edged fellow Seattleite Ted Jones in his The Wasp to win the Northwest Speedboat Championship. McRae’s average speed for the fifty miles was listed as 60.250 mph and he covered the marathon course in fifty-six minutes even. He was a full two laps ahead of Jones at the finish line. While McRae easily won that final challenge race, his other contributions to the sport of hydroplaning have largely been lost to history. Conversely, the significance of Ted Jones and his The Wasp to the history of the sport has to be considered monumental. Built in 1936 as a three-point hydroplane, The Wasp appears to have acted as Jone’s experimental laboratory for the later hydros that he would design and build including the legendary Slo-mo-shun unlimiteds. By 1957, the Fourth of July event had shrunk to a single day celebration, which consisted mostly of water skiing and wakeboard demonstrations. Then came the early summer of 1958… and boat racing on Lake Coeur d’Alene would never, ever be the same again. NEXT INSTALLMENT: Slot Machines, the Athletic Round Table and the beginnings of the Diamond Cup for Unlimited Hydroplanes. 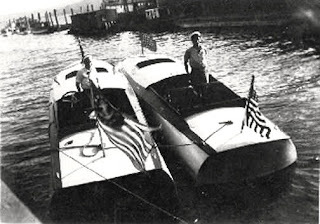 The Lake City of Coeur d’Alene hosted competitive boat racing long, long before the first Diamond Cup Regatta in 1958. Beginning in 1913, competitive inboard races became the centerpiece of the city’s annual Fourth of July celebration and provided thrills, chills, and spills galore to entertain thousands of visitors over a three day period leading up to Independence Day. The 1913 regatta featured the first of many speedboat “challenge” races, and it took place on the last day of the first regatta. It was so successful and well received that it would prove to be the main attraction of each of the thirty-some regattas that followed. The first such “challenge” pitted Spokane boat merchant A.C. “Al” Ware and his race boat Spokane against Stanley “Stan” Case and his “fast hydroplane” Allegro. The regatta organizers had tweaked the design of the seven and one-half mile racecourse between the Thursday and Friday racing programs so that much of the action was in view of the many spectators on hand if front of the Tubbs Hill grandstands. With the new course configuration, the boats crossed in front of the spectators twice rather than just one time at the finish of the race. 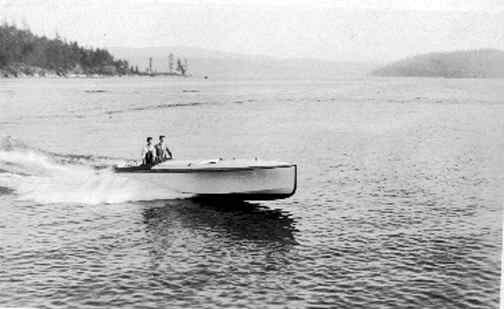 The initial speed record for Lake Coeur d’Alene was likely set at 1913’s initial speedboat “challenge” race. The race between the Spokane and the Allegro was close from start to finish, and it was either boat’s race to win as they stormed to within twenty-five yards of the finish line. It was there that Ware floored it and won by a convincing three boat-lengths. Ware had covered the course with the Spokane in ten minutes and four seconds for an average speed of a blistering 44.7 miles per hour. In light of the financial issues that would plague the Diamond Cup throughout its ten-year existence, it is interesting to note that that the initial Fourth of July regatta broke even financially after all of the expenses had been paid. The success continued on to the second annual regatta, this despite the fact that the third and final day of the 1914 program was filled with a steady rainfall that lasted all afternoon. Despite the less than ideal conditions, an estimated 2,500 spectators witnessed the closing events of the regatta including the regatta sweepstakes “challenge” race. Street vendors, announcers, participants, and event officials who were not unable to take refuge in the covered grand stand on Tubbs Hill were thoroughly drenched by the downpour according to reports of the day. The 1914 regatta sweepstakes challenge race was particularly memorable because of what occurred at its conclusion. The race in question was an expanded nine-mile long regatta, and it was easily won by the aforementioned Ware brother’s Spokane. Henry French’s St. Joe finished right behind the Spokane, and Harlan Peyton’s boat finished a very poor third. After the race it was discovered that Peyton’s boat had somehow picked up six feet of decorative bunting from somewhere on the course, and the material had become wrapped tightly around the boat’s propeller which certainly explained its lack of power during the contest. The discovery of the unseen “handicap” led to shouts from the crowd of “race her over again!” and the judges huddled briefly to discuss the situation. The officials then announced that the three boats would race one more three-mile lap to determine the winner. The results of the re-run were exactly reversed with the Peyton’s boat taking first, the St. Joe taking second, and the Spokane finishing in third. The Peyton brothers had donated a special silver cup to be awarded to the winning craft in the speedboat sweepstakes. Ironically, the Peyton’s overcame the stray bunting “handicap” to take that trophy home with them. Despite the weather, race organizers reported that they finished the second annual three-day affair in the black, having made several thousand dollars in profit. The budget for the 1914 regatta had been set at $3,000 for program and entertainment. 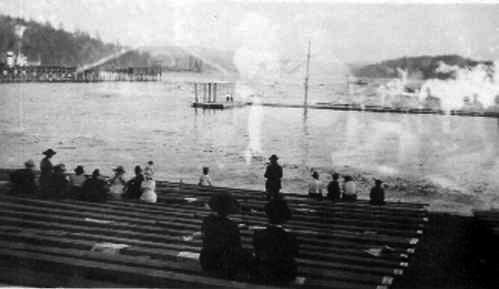 By 1915, the Coeur d’Alene Regatta group had inexplicably moved their venue from Tubbs Hill to back in front of the City Park as originally had been planned. I could find no stated reason for the move, but a post regatta review in the Spokane Spokesman-Review newspaper had a crowd of six hundred viewing the boat races from the relative comfort of a temporary grandstand that had been constructed on a pier at the foot of the Sherman Street landing. Among the entrants that year was Ramsey Walker, an early day banker in the Lake City. He had contracted to have the Tipperary built by a young Coeur d’Alene boat builder named Bob Yandt in hopes of winning the challenge race. The boat’s engine was in the area of 225 cubic inches and was said to have turned over at 1,200 rpm and was capable of speeds near 65 mph. Also building a boat for the 1915 races was Wallace mining magnate Jerome Day. Day went as far as having an Eastern U.S. boat builder construct what he was eventually to christen The Pep in hopes of defeating Walker’s Tipperary, but the boat almost didn’t make it safely on to the lake. A small fire in the Carver Boat Shop on Second Street on Friday evening threatened to damage The Pep. Fortunately, the spanking new craft escaped undamaged, and Day was able to launch it on Saturday afternoon in time for the first round of racing. The Sunday, July 4th portion of the program on the Regatta’s middle day drew what was estimated an estimated 6,000 spectators during the day, and even larger crowd was expected for the Monday closing program of racing. The big draw on Sunday was a parade of watercraft led by the steamer Georgie Oakes and the burning of pioneer steamer Spokane. Despite having a charge of dynamite in its hold, the Spokane refused to sink and burned to the water’s edge. The 1915 sweepstakes challenge race went to Walker’s Tipperary, and news reports tell us that he covered a much shorter four-mile course in eight minutes, nine and three-fifth seconds, edging out the Peyton brother’s boat. With Bob Yandt doing the driving honors, the Tipperary easily ran away from the The Pep as well. The final day of the 1915 regatta drew over 5,000 people, and because of its growing success and the ideal weather enjoyed over the three-day event, the organizers made plans to increase the budget from $3,000 to $5,000. The profit from the event was reported to be in the area of $2,000 to $4,000. By the fourth year, coverage of Coeur d’Alene’s event began to dwindle somewhat in the Spokane media. The lone reference to the boat races came in the Coeur d’Alene Press, and it tells us that Horace Peyton, driving a new version of his earlier winning design had won first place over an unidentified craft driven by Paul Schroeder in what was now called the Peyton Trophy speed boat race. The two boats reportedly covered the three-mile course in record time, but the time was not recorded for posterity. The regatta continued be a great success in the eyes of its organizers and to be modestly profitable, but efforts to create an Independence Day celebration in Spokane and the introduction of motorcar racing at the Alan Race Track near the Idaho-Washington state line eventually cut into the bottom line of the event. Later regatta weekends did not appear to match the huge crowds that watched the races in the first four years of the event. A post regatta article in the Spokane Chronicle revealed that in 1917 only several hundred witnessed the event, and it raised only “several hundred dollars” for the Red Cross. Despite the drop in popularity, the city fathers stuck with the Fourth of July regatta format, and the event continued to evolve in much the same way that the boats evolved over time. PREVIOUS INSTALLMENT: The History of the Diamond Cup - How it all began. This coming Labor Day weekend, the Diamond Cup for Unlimited Hydroplanes will return to Coeur d’Alene Lake after a hiatus of forty-five years. Not since 1968 have inboard speedboats competed for supremacy of the waters at the northern end of the lake. This is the first of several blog entries designed to tell of the rich history of the Diamond Cup and of Coeur d’Alene’s love-hate relationship with boat racing. It is my hope that you will enjoy reading about the people and race boats that brought thrills, chills, and general excitement to the waters near the shores of the Lake City over the past 100 years. This year we celebrate fifty-five years since the inaugural race for Diamond Cup trophy for unlimited hydroplanes, but the story of racing on Lake Coeur d’Alene doesn’t actually start in 1958 as most residents of the community might think. 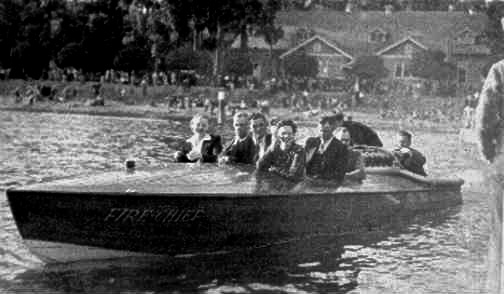 In actuality, one must travel back a full 100 years to the day when the actual inaugural of competitive inboard racing on the lake first occurred when the city fathers of Coeur d’Alene first made it the centerpiece of their annual Independence Day celebration. 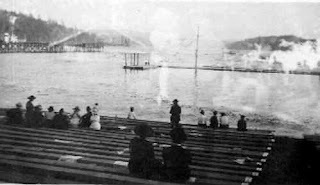 Newspaper records show that the first competitive roostertails spouted over Lake Coeur d’Alene on July 3rd of 1913 as part of a city’s inaugural three-day water sports-oriented Fourth of July celebration organized by the newly formed Coeur d’Alene Chamber of Commerce. That first event had its genesis at a January 16, 1913 meeting of the city’s chamber organization where the idea of holding a “regatta” was first hatched at public meeting of the organization. An article in the Coeur d’Alene Press in 1914, reflecting back on the pivotal chamber meeting revealed that it was a local physician, Dr. W.W. Scott who led off the meeting with a proposal that the group develop a “summer amusement” event along the lines of a Chautauqua meeting. The proposed event would occur annually and henceforth would form the centerpiece of each Fourth of July celebration. Another Lake City businessman, Ray Hart, seconded the proposal made by Dr. Scott and the proposal was passed by the Chamber membership unanimously. Having settled on holding the first ever event, the chamber group’s discussion focused on what such an event might include. At some point in the discussion, an unidentified chamber member “remembered” that the city had a lake that was not being used for anything other than steamboat travel and for the towing of logs to the various lumber mills that had sprouted up around the lake’s shores. 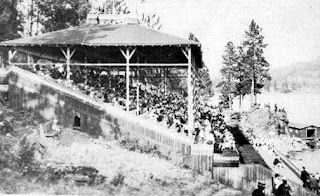 While lumber and steam travel had both placed many dollars in the pockets of the young Coeur d’Alene community, nothing had been done to use the adjacent lake for the amusement of its populace. Chamber of Commerce President T.R. Gerdes appointed an executive committee to develop a plan for a “regatta” to focus on use of the lake for entertainment. Eventually, the committee settled on a plan that would provide a full-slate of water based activities over a three day period leading up to the Fourth of July each year. Among the events included in the proposed regatta were “competitions” which included canoe racing, logrolling, swimming and diving competitions, and inboard and outboard boat racing. The original plan was to actually hold three separate regattas – one on Memorial Day, one on the Fourth of July, and the third event coming in August, but that plan was rejected because of the enormity of the planning involved, and a decision was made to hold the aforementioned three day event surrounding just the Fourth of July instead. One of the biggest problems facing the executive committee that first year was a decision on what would be the best location for the majority of the regatta events. The first location that was considered was just off the lakeshore in front of the City Park, but this area was rejected for several unstated reasons. The next property the committee considered was the summer residence of the Austin Corbin family of Spokane, which was located on the southwest point of Tubbs Hill (now called Corbin Point). That location was also eliminated from consideration, however, when an unidentified third party stepped in at the last minute and purchased the property. Disappointed and angry at the turn of events, the members of the committee set about again looking for another site. The location that was finally settled upon was located on the south side of Tubbs Hill, and the committee moved quickly to purchase it for use as the official regatta site. The rocky hillside there made a grand venue to watch action on the racecourse and the areas designated for the watersports competitions. The location also presented the spectator with an unparalleled view of the lake and the surrounding mountains. Access to the event grounds was relatively easy, and could be reached either by a five minute boat ride by water taxi or by a dirt and gravel trail which still winds around the perimeter of the of the hill. The Fort Sherman Dock Company quickly erected a grandstand facing the watercourse, and they did so with an understanding that they would receive a fifty-fifty split of the revenues from the structure’s use each year. The committee also purchased chairs and tables from the Spirit Lake Chautauqua, and the furniture was placed around the site in areas with “advantageous” views. Things were falling together nicely for what everyone hoped would be an event to remember. Community members donated “liberally” to the regatta committee in the early days of the project. They gave in large and small amounts, and the Merchant’s Association made news when they gave a generous $500 donation to the committee (Note: In modern dollars, the donation represented approximately $11,284 in buying power). At about the same time, a Miss Emma Nikolas donated use of the ground floor of the Otterson building as the headquarters for the regatta. The town of Spirit Lake as well as the Northern Pacific, Milwaukee, Spokane International, and electric railway companies each donated silver trophy cups. In addition, the city council unanimously donated $400 from its budget to go towards providing music for the event. The very first inboard race was held over a seven-mile course on July 3, 1913 on the very first day of the regatta celebration. 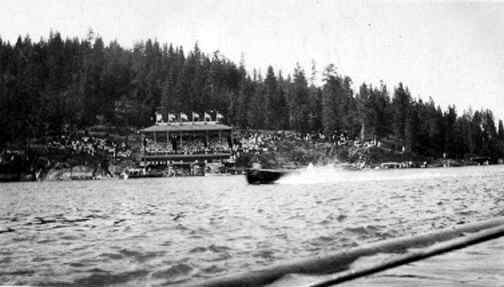 Details are somewhat sketchy, but the seven-lap race around a one-mile course in front of the Tubbs Hill viewing area pitted the motorboats of Dr. W.W. Scott of Coeur d’Alene and W.H. Carver of Rockford, Washington. Dr. Scott’s launch Kryptok and Carver’s launch Ogema were driven in the race by their twelve-year-old sons, W.W. Scott Jr. and Gale Carver. The record shows that the Carver boy easily won the race by exactly two and one-half minutes, covering the course in thirty-five minutes and thirty seconds. The record also shows that eight horsepower Perfection engines powered both boats. Over the three days of that first regatta, classes representing 8, 16, 20, 24, 26, and 40 horsepower engines raced. The competition reportedly drew great interest from the crowds and established the motorized boat racing as a staple of the yearly regatta activities. It was clear that a tradition of competitive boat racing on Lake Coeur d’Alene had begun. Word of the event reached far and wide as Ralph A. Earle, western cameraman for Pathe’ Weekly filmed moving pictures of the various regatta events. The resulting footage was used in the Pathe News newsreel features in movie theaters both in the United States and abroad. Also carrying the story of the event to the outside world was an illustrated report of the boat races was published in the August issue of Seattle’s Pacific Motor Boat monthly magazine. It must be noted that the inaugural three-day event ended with nary an accident on the water nor a problem of any kind in the community. Orderliness prevailed in all venues, and the city police reported that there were no attempts at pick pocketing or any other “strong arm” behavior. This was made all the more surprising by crowd estimates of nearly 20,000 people visiting the city and attending the various events.